RIESTS ARE SUPPOSED to make an annual retreat. This past week, I made my retreat at the Abbey of the Genesee, a monastic community of bread-baking Trappists in the Finger Lakes region of New York State. This was my first trip to this particular Abbey, and it was a terrific place for retreat—serious silence, gorgeous grounds, and ample accommodations. Retreatants are invited to join the community for the communal praying of the Divine Office, which forms the rhythm of monastic life. 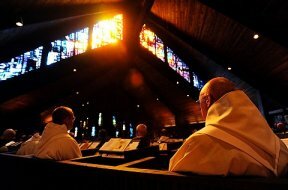 The first time I joined them, for evening Vespers, I was impressed by the experience. In the midst of an Abbey building that I found much too dark and structurally unattractive, the sound of the monks chanting together was profoundly beautiful. Their chant is quite simple. 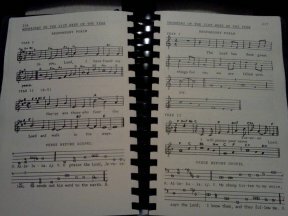 They use simple Psalm tones, and the melodies for their antiphons are all syllabic or neumatic. They used exclusively English texts during my visit, but they have books of the Ordinary chants in Latin in their choir stalls, too. What impressed me, then, was not the complexity of their singing or the technical difficulty of it. It was the simplicity, and most especially their unity. As these monks chant, they do so as with one voice. The use of the organ is subdued, intended only to support the chant. The monks chant rather softly, but the organ never competed with the singing. The collective mora vocis at the ends of phrases were masterful. When we would have visitors at my seminary, Saint Charles Borromeo in Overbrook, people would often remark how impressed they were by the place, both the structures and the residents. If they joined us for Sunday Vespers, they would undoubtedly remark about the beauty with which the seminarians sang. They would talk about receiving a sense of peace during their visit and being inspired by the sight of all the seminarians processing in and out. I distinctly remember just taking their observations for what they were worth, because surely they would think differently if they actually lived in our community. If they knew the personality conflicts, the rivalries, and the unkindness we sometimes showed to one another, they would have been less edified. But, was I wrong to think that? Were the beauty & unity they observed shallow and phony, or was there something more to it? After the last week, I am inclined to think it was real. The retreat experience at Genesee was terrific, but I would be naïve to presume that their community is much different than my seminary community was. Religious life is beautiful, I’m sure, but I am just as certain that it is not heaven. There are undoubtedly interpersonal struggles there at the Abbey. But their chant was, nevertheless, beautiful. Even with the interior struggles which it is reasonable to assume are present, when these monks pray, they do so with one voice. You almost cannot make out individual voices. Is it not beautiful to consider that chant can be a vehicle for the expression of such unity—unity that goes beyond petty divisions?